Nearly 40 Zumba studios have cropped up in the 50-square-mile region of South L.A. over the past few years, offering homegrown exercise facilities in an area that had long lacked affordable options. In an area of Los Angeles where the population faces a surfeit of obesity, the classes may be one way Angelenos in South L.A. can work toward shrinking their waistlines. The environment itself has been one of the biggest obstacles to healthy living. There are few parks for calisthenics. Crime poses a threat to early morning or late afternoon runs. And traditional gyms are virtually nonexistent. All these factors make it particularly challenging for residents to stay in shape, according to Gabriela Gonzalez, a project manager for health programs at Esperanza Community Housing Corporation. “There’s no green space, so there’s nowhere to do exercise,” she said. Zumba got its start in Cali, Colombia in the mid-90s when aerobics instructor Alberto “Beto” Perez left his usual music at home one day. In its absence, he grabbed some salsa and merengue CDs from his car and improvised new steps for the Latin beats. The class was a hit. Perez moved to Miami to expand his audience, and started making exercise videos and infomercials under the Zumba brand. By 2002, Zumba had sold hundreds of thousands of videos, and fitness teachers were asking Perez to certify them to teach. Perez made certification simple: Attend one daylong workshop. Then all you need to begin teaching is a set of speakers. Recent workshop rates range from $225 to $315, and the optional instructor membership costs $34.95 a month. Those fees are just part of the revenue collected by Zumba, still run by Perez along with two Colombian entrepreneurs who coincidentally share the first name, Alberto. Apparel, videos, music, workshops and conferences all contribute to the company’s estimated value of half a billion dollars. Zumba’s appeal skyrocketed during the recession as people suddenly laid off from work found a way to make money teaching classes. Zumba has since spread to places as disparate and far-flung as Israel and Japan, morphing into a fitness craze that boasts 15 million people taking classes in 180 countries – nearly every nation in the world. Perez didn’t originally set out to boost the health of entire communities–particularly not low-income ones fighting obesity and related concerns such as high blood pressure and diabetes. 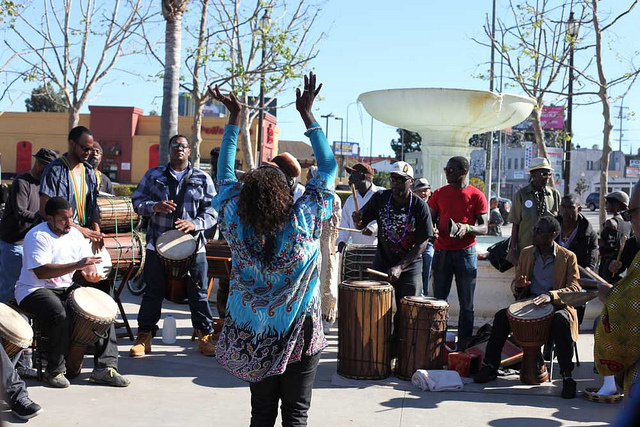 Still, the dance craze has tapped into a specific need in South L.A. According to an L.A. County Health Department survey from 2011, nearly 30 percent of children in grades 5, 7 and 9 are obese. Of adults, roughly 35 percent are obese. That’s nearly twice the obesity rate for children in West L.A. and more than three times the rate among West L.A. adults. 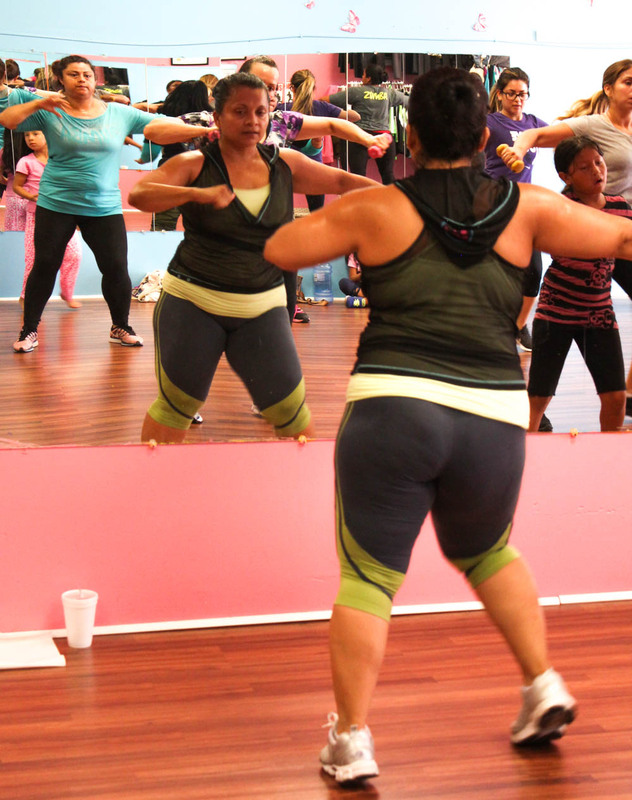 Although no studies have yet documented it, Zumba may actually be helping to chip away at South L.A.’s weight woes. Taking three, hour-long Zumba classes a week more than satisfies the Centers for Disease Control and Prevention recommendation of 150 minutes of exercise per week. When Noemi Romero, who came to the U.S. from El Salvador 15 years ago, began taking Campos’ Zumba class six times a week a couple of years ago, she lost 20 pounds within a month. A mother of three, Romero squeezes in classes around her schedule working as a medical assistant. “Obviously, we can dance when we like the music that comes along with Zumba,” Romero said in Spanish, relaxing on an aerobics step with her legs stretched out in front of her after class on a recent morning. Teacher Pamela Ramirez has her own weight loss story: She lost 70 pounds from Zumba classes four years ago after giving birth to her second child. 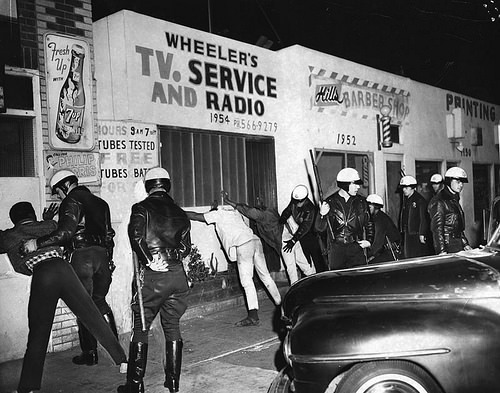 At the time, Ramirez, who is about five feet tall weighed close to 200 pounds. Ramirez said she has heard plenty of similar stories. Listen to Ramirez and fellow teacher Stephen Pineda describe how the fast-paced exercise is helping people to lose weight, as they take a break from teaching at a Zumbathon, where forty students gathered at one studio for two hours of non-stop dancing with golden trophies awarded to the best dancers. It’s converts like Campos and Ramirez who have boosted Zumba’s popularity in South L.A.
Policymakers and nonprofit leaders, in contrast, have focused their health efforts largely on nutrition because food comes before exercise for low-income families, according to professor Lavonna Lewis of the University of Southern California’s Public Policy school. “People need to eat,” she said, adding that families without a discretionary income may not consider Zumba important. And people relying on government support may simply not be able to shell out money for private classes. 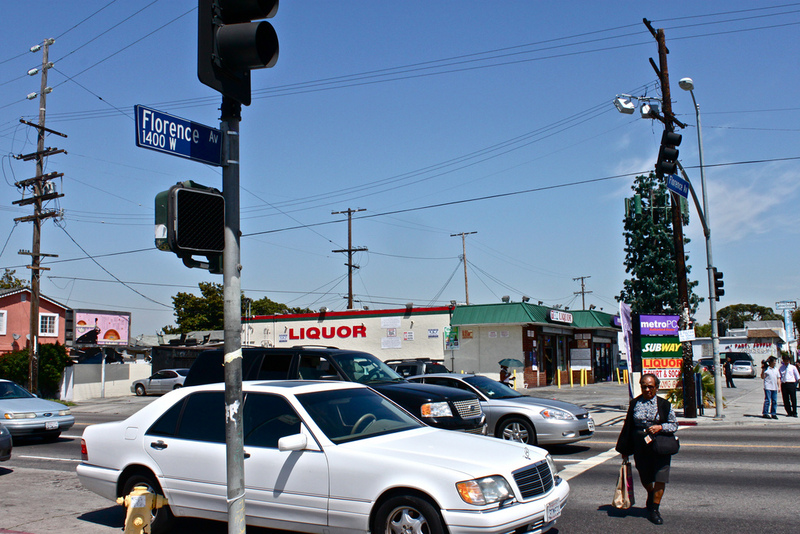 In South L.A. the majority of families earn less than $20,000 a year according to the U.S. Census. On average, residents in the area have among the lowest incomes in Los Angeles. One of the reasons for Zumba’s success is its low price point: Ramirez’s class costs $2.25 per session; most in the area cost $3 or less. Elsewhere in the city, you’ll find the same workout going for $20 in Brentwood, $15 in Atwater, $15 in Culver City, $10 in Eagle Rock and $6 in Hollywood. Campos said she has seen some families choose to spend money on food rather than exercise. “There are many people that say, ‘Do I go to Zumba, or do I buy a package of tortillas?’” she said. 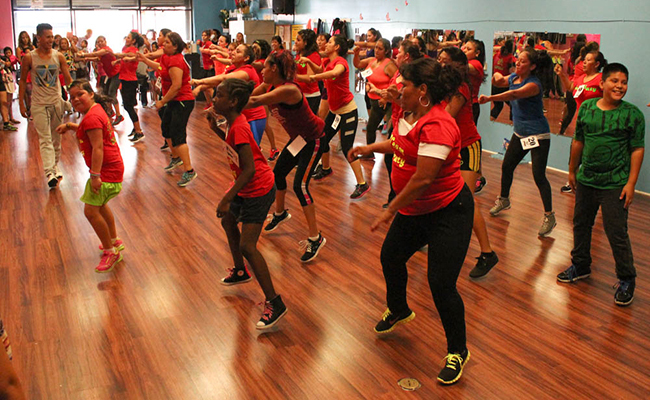 Creating an unthreatening yet sustainable price point has challenged South L.A. Zumba studios, especially with new ones continuing to open. As teachers compete for business, some have opted to lower their prices to attract students. Others have raised prices to stay afloat. For a final group of studios, keeping prices low has made it impossible to make a profit, and they have been forced to close. Santa Torijano opened her studio with an adjoining gym on South San Pedro Street five years ago in hopes of helping her neighbors develop healthy lifestyles. She and her husband both earned aerobics and personal trainer certifications from the YMCA. They say their gym, a narrow storefront packed with cardio and weight machines, is the only one in the immediate neighborhood. “It was a risk because the rent is very expensive,” said Torijano in Spanish, noting that many Zumba studios have closed even in the span of a few years. Her own classes have dipped from 70 students a class to 20 or 30. She relies on a mix of incomes—from class fees and sales of merchandise and Herbalife products—to pay bills and the rent, which together total $3,500 a month. Often her work feels like “community service” motivated by the need for exercise opportunities. Still, she and her husband are determined to continue. The Torijanos’ Zumba studio is at 2807 S. San Pedro St., Los Angeles, 90011. 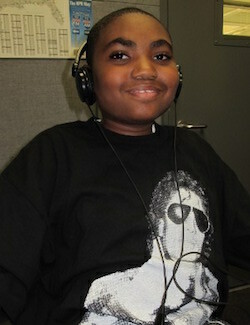 You can reach the studio by phone at (213) 909-8375 or (213) 908-4827. Like Intersections on Facebook, follow us on Twitter and sign up for the Newsletter to stay in the loop on news and views from South L.A. Email the author at [email protected] and follow her on Twitter at @dainabethcita.